Headed out as per usual today. Went up into Gunner Inlet to check on things & found none of my furry friends. Gunner just doesn’t seem very hot for bears lately! So I headed over into Fortune Channel. I met the “Browning Passage” heading back into town. She was just about to enter Dawley Pass.Took a few on the fly & continued on into Fortune looking for bears. I found one near Creative Salmon’s farm. I immediately recognized him! He had a “nick” out of his right ear & a few recent wounds too! I called this bear “Nic”. The light was perfect & so was the bear! What I want is to have the bear looking straight at me with the sun directly behind me! This makes the bears fur really shine! A “halo” can be seen all around it’s face! They look very beautiful when this affect happens! Their fur has a shine to it like nothing else I’ve ever seen! Spent some quality time with my old friend! He’s always been such a perfect subject! While I was taking shots of Nic,I noticed further along the shore to the north a second bear! They literally were popping out of the woodwork tonight! I decided to head on over to this second bear & see how things went? It was a younger bear & I didn’t recognize it. It gets tricky trying to remember all the bears in the area! Another fellow & I both agreed that there are around 60 bears up in Fortune Channel. Obviously a rudimentary guess, but it still is basically alot of Boo Boo’s! I noticed the sun about to go behind the mountains on Meares Island & knew It was my cue to start heading back or I’d miss the sunset in the harbour! Said goodbye to my young furry friend & began the trip back. On the way I noticed this very expensive yacht (The Calliope) anchored in Heelboom Bay! This thing had to cost a million! Some people have too much & most do not have enough! I took a few & continued along my way. I stopped at Tsapee Narrows to visit with the Daredevil. Delilah was a no show. I always like to try & grab a great shot of him against that black background! Very tricky,but I manged to get a few good ones. Said goodnight & headed into the harbour for sunset.The fog was close enough to snuff the light close to sunset,so I didn’t get much with Romeo/Juliette. Said goodnight to both Romeo Juliette (btw,this years eaglet did not survive!Not sure what happened?) & went into the harbour to search for a willing subject? I found a canoe with three people paddling & also a row boat. Took a few & called it a night. Another stellar nights shoot folks! This is the best I could do with all the trouble I had tonight! All I could do is watch this gorgeous sunset & curse! My boats motor was acting up & I could only move at a snails pace! I missed the whole shoot tonight because it was spent trying to get back to Tofino before dark! Can’t remember a worse night actually! UPDATE: June 11th – Found out my plugs were gummed up from a fuel/oil mixture that was too rich! My older motor took a richer blend than my new one,but I kept mixing it like I use to. That built up carbon on the gap & produced a poor spark. Put in new plugs & she’s purring like new now! The best way to find a whale is not to look for the whales but to look for Whale Watching boats and the same applys to bears! I saw Mike Whites boat inside a bay and knew instantly that there must be bears down there and sure enough there was! All the Whale Watching boats draft much deeper than me and have to stay a ways away from the bears. Whereas I can kick my motor up and go into about 8 inches of water! It was low tide and slack had just turned, so I knew that with the tide coming in that I wouldn’t be getting stuck on the bottom! I waited for Mike to leave because I didn’t want to possibly spook the bears! I wouldn’t be very popular! I always wait until there is nobody around. I shot this as they were leaving the area from watching “Salty and Pepper” on shore. The fellow on the bow is Bertie from England. A young photographer who is keen on getting wildlife shots around the area. I will be taking him out on some of my own wildlife adventures. As I was heading out of the harbour to the east,I saw Mike White’s boat,The” Browning Passage” heading west towards me! 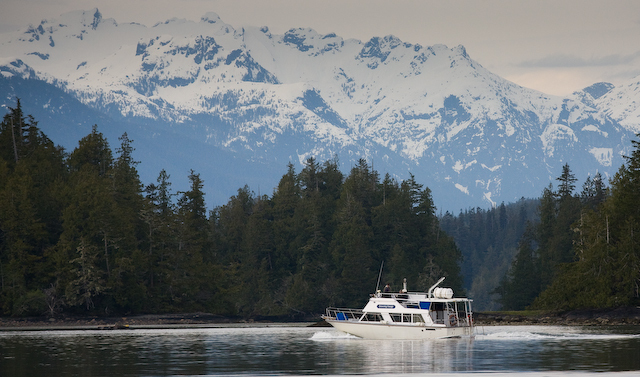 Ironically I took this shot in the area that the boats name comes from…………Browning Pass! With the tide being low,I bet I know where he was coming from! 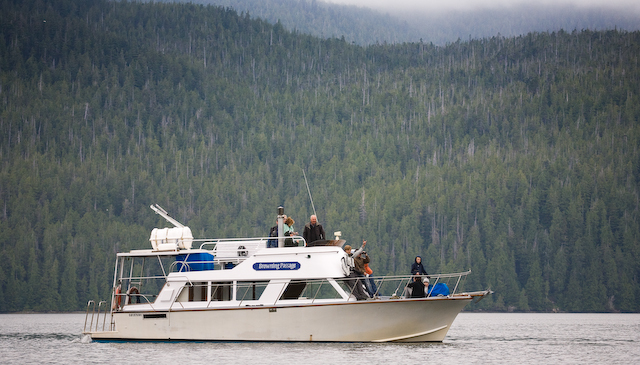 Mike takes folks out on wildlife cruises and probably was down either Fortune Channel or Gunner Inlet looking for bears. Gunner Inlet seems to be an almost guaranteed spot to see bears. I went there today myself and found that Sow with her two cubs eating barnacles off of a old tree. I was able to get out later in the afternoon today. We had some thin cloud once again. It diffused the light but I went anyways.